If you are regular golfer you may need to buy a push-pull cart at some point so as to save on the cost of renting. And knowing the reasons why you need one will help you significantly when shopping for one and it is also important to know what to consider when shopping for a push-pull cart. 3 Which Type Of Golf Cart Is Best For You? When going to the green for some rounds of golf, there are different fees that you have to pay for besides the tee fees. However, of all these fees the most significant is what you spend to rent golfing equipment. It might not look like much, but if you are a regular golfer, then you will spend a lot of money in the long run. All the golfing equipment that you own or rent need to be carried around from one place to the other and so for this, you need a cart. You can rent a motorized cart to use to move around or a push-pull cart if you want to save some money. However, if you are regular golfer you may need to buy a push-pull cart at some point so as to save on the cost of renting. And knowing the reasons why you need one will help you significantly when shopping for one and it is also important to know what to consider when shopping for a push-pull cart. Convenience: being able to move around on the green with all your golfing gear will have a significant impact on your game. When playing golf, you should never have to worry about locating a club, gloves or even a ball when playing and you should only concentrate on playing the game. The push-pull cart offers you convenience by ensuring that everything that you need is close to you, and you can easily retrieve it when you need it. Speeds up Play: It can be annoying when playing with someone whom you have to wait for a couple of minutes as they try to locate their gear when it is their round. When the game is slowed down, it becomes very boring but with a push-pull cart, you will never have to delay your play as you will always have what you need close to you. It Reduces Fatigue: If you do not have enough money, or you are not willing to spend an extra coin to hire a cart or pay a caddie then, you will have to carry your gear around the course. There are several clubs and other equipment that are involved in the game, and so they can be very heavy and hence leading to fatigue. The cart eliminates or reduces fatigue since you do not have to carry anything and hence you can save your energy for the game. Eliminates the Need For Caddies: Caddies can be very helpful on the course, but it does not always feel good to have someone running behind you carrying your gear. Apart from this, they also have to be paid, and they are also known to misplace gear. With the push-pull cart, you do not have to hire a caddie since you can push or pull the cart yourself. It is Stylish And Adds Some Professionalism: A push-pull cart is a stylish equipment, and it makes you look like a serious or professional golfer when on the course. If you chose a good design, you would stand out from the other golfers on the course. Which Type Of Golf Cart Is Best For You? Golf carts or trolleys are no longer the preserve of elderly golfers as even young players have discovered the many benefits of using them to move around the green. With a golf cart you do not have to waste all your energy carrying the gear, and so you can preserve it for your shots. Due to the increased popularity of trolleys different types have come up with the main ones being manual golf push carts, manual golf pull carts and electric golf carts. They are all widely used as each has its merits and demerits. It is important to understand them and most importantly to know what to look for when shopping for the best golf push cart. Trolleys come in all shapes and sizes and with different features, but there are particular things that you should consider when getting the best trolley. When shopping for a cart whether you want to buy the manual or electric you should consider things such as brakes, storage and accessories, construction material, weight, foldability, speed, control/handle and ease of assembly. The best type for you is the one that conforms to your specific needs whether it is a manual or electric because each one has several things that give it an edge over the others. Looking at what each of them is and its merits and demerits should help you in choosing the right one. Manual pull carts are two wheel golf trolleys that you drag behind you around the course, and they are the smallest and also the simplest types. 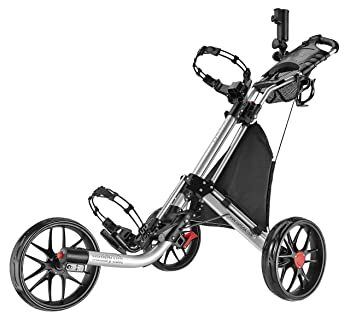 These trolleys are best suited for golfers who do not have much to carry and do not also want to use up a lot of energy on their carts as they are very light. Manual pull carts are by far the cheap golf carts on the market and so when shopping on a budget they can save you a lot of money while still offering you useful services. They are also the lightest. Most of them are lighter than the traditional push carts that most golfers prefer using. Pull carts are simple and straightforward, and hence, you can quickly assemble and fold them. In fact, most can be folded in one or two easy steps. Dragging the cart behind may not feel very comfortable when on the course. Since they are small, they do not have a lot of storage space, and so most of them may not carry everything that you may wish to move. A push trolley is perhaps the most popular one and as the name suggests it is propelled by pushing it as it does not have a motor. It is mostly a three wheel cart and is more stable than the two wheel pull cart and due to it stability it has more features and storage spaces. There are also some modern ones with four wheels. It is cheaper than the electric one despite having almost similar features with the only notable difference being the lack of a motor. The push cart is easier to control than the pull one since it moves ahead of you and hence making it possible to plan a clear path as you can see where it is going. In case something was to fall off from the cart you would notice immediately simply because the cart is in front of you. Manual push carts are lighter than electric ones since they do not have heavy motors, and they also have more storage space. Although the cart is lighter than the electric trolley, it will still take a lot of energy to move it around the green especially if you have a lot of gear to carry. They are bigger than the pull carts, and so even when folded they will occupy more space, and this can be stressful during storage and transportation. The electric trolley is the best thing that has ever happened to mobility on the course as it makes things easier and faster for all golfers. A motor powers these carts and so you need not push it or pull it. After powering it up the only thing that you will do is to control it. However, there are many designs from different manufacturers, and so you should consider things such as the battery size and additional features and accessories to buy the best golf cart. They will save you a lot of energy since you will not have to pull or push. Most have display consoles with some additional features such as distance measurement and time. Overall they move faster than the others since they use a motor. The speed will still be maintained even when you are tired from playing. Are designed with sturdiness to maneuver in any course terrain. Electric trolleys are more expensive than manual push or pull ones, and so you should be ready to part with more money to get one. The battery for most of them does not last beyond one round and so in most cases you will still have to use some energy to push it around. There are many companies that are currently manufacturing and distributing these push carts as they have become very popular with golfers over the years. And so you can rightfully expect to find different designs, shapes, and sizes when shopping for a push cart. However, in the midst of all this, it is important to know what to look for so that you can get the best golf cart or one that will add value to your game. To make sure that this is the case you should consider the following important things before buying a push cart. The handle Quality: When fully loaded with golfing gear the cart will be very heavy and so steering it around the course may be problematic if it does not have a sturdy handle. The handle should be ergonomically designed and easy to grip to increase maneuverability. You should choose the best golf push cart with a handle that lets you hold it comfortably from a natural position, and it should also be padded for a more comfortable grip. Wheels and Parking Brakes: Golf courses have a rugged terrain, and so you should buy a cart that has large wheels that can be able to maneuver smoothly through this terrain. The wide rubber tire also helps to move around the smooth areas of the course without any trouble. It is important to note that the larger the wheel, the lesser the work for you when pushing the cart. Also, check on the parking brakes and consider whether they are designed to lock on one wheel or all the wheels. Ideally, a cart that locks all wheels when parked is better than those that only lock one wheel. Weight/Bulkiness: The weight of the cart is important both on and off the course. If the cart is heavy, it will become even bulkier when you add your golfing gear. Transporting it will also be a problem if the push cart is heavy. 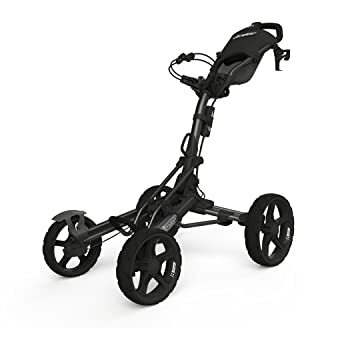 It is, however, important to note that the more the features, the bulkier the best golf push cart will be, and so you have to come to a compromise between the features you want and its weight. Portability (Ability to collapse completely): This is one of the key things that you should consider when shopping for a push-cart as it will affect how your move the cart from your home to the course. A good cart should be able to collapse completely when not in use so that it will occupy less space in your car and at home when storing it. Storage (Pouch, Pocket, and post): The pouch, pocket, and post are essential in any push cart as they provide you with a storage place for your phone, rangefinder, phone umbrella and other small things that you may take with you to the course. You should consider their size, durability and their design because all these will influence how safe they keep your valuables. Ease of Use: You should always choose a cart that is easy to use starting from how it if folded and unfolded and attaching the bags and other fasteners. Make sure that you can quickly open or use any latches on the accessory compartments and any other mechanical feature on the cart before buying it. Additional Features and Accessories: The aim of buying the best golf push cart is to make the game more interesting and make things easier for you on the course. And so you should look for a cart with more features and accessories rather than buying one that can only move your gear from one place to the other. Customer Reviews: Before buying, you should refer other golf push cart reviews on reliable websites to get a best one. 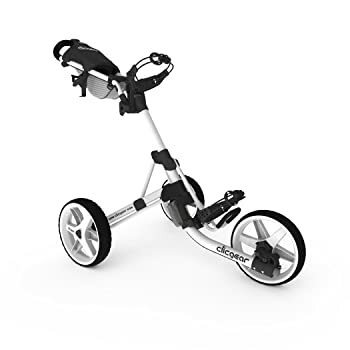 Apart from the factors mentioned above, you should also consider the price and manufacturer to ensure that you get a top notch push cart that will help you take your golfing to the next level. All in all, it is important to keep in mind that the best push cart for you is the one that will make mobility easier for you on the green. The Clicgear 3.5 plus Golf Push Cart builds on the 3.0 that was very successful. It does this by giving it some improvements with the aim of making mobility on the course easier for golfers. Coming from one of the most reputable companies in the manufacture of push and pull carts the 3.5+ had big shoes to fill, but it succeeded and perhaps even surpassed expectations. Although the design is quite similar to its predecessor, it feels more comfortable and easier to use thanks to a couple of new features and the improvements. Has a unique design that lets it fold as small as a five-gallon bucket. This makes it easy and convenient to carry and store. This cart has a flip switch brake that will require minimal energy to operate, and this is a very significant advantage as it prevents you from unnecessary energy drain when on the green. It’s very stylish and attractive thanks to the right color choices and excellent design. Clicgear 3.5 plus has a solid construction design for increased durability but even with such high-quality materials, it still maintains a lightweight. Unlike most others, it is very stable and sturdy on the course and it handles a rough terrain pretty well. The folding process is quite complicated, and it can take up a lot of minutes if you are not yet used to the cart. Users also complain a lot about the cup holder provided as it takes two hands to fit anything there and most golfers will probably not like this. The CaddyTek Superlite comes from a manufacturer that is well known for cheap golf carts but high-quality golf push carts. It features a heavy duty construction with a steel frame that is also incredibly lightweight weighing less than 12.2 pounds. This cart also has a wide body design and a nicely padded handle that can be adjusted to four different positions for pushing the cart. Also, it provides some extra space for storing your umbrella and beverage bottles. CaddyTek Superlite also has the patented bag holder that can be found in most other trolleys from the same manufacturer. To make it complete, the wide tires also have ball bearings for smooth performance even on the roughest terrain. With this cart, you will never have any issues folding and unfolding since the manufacturer has designed it to be very simple. In fact, it will only take you a minute to do this. It’s very light and so pushing it on the green will almost be effortless meaning you get to spare most of your energy for the shots. The brakes work amazingly well when parking and also one any terrain. CaddyTek SuperLite is very smooth and quiet, and you will hardly hear it make any sound when on the move. Although the brakes work perfectly well, it will be hard to operate them when wearing certain types of golf shoes, for example, those with bendable or soft soles. The bottle holder is very useful, but its position on the cart will be inconvenient for some golfer. 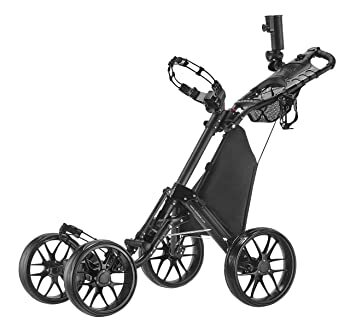 Clicgear Model 8.0 builds on the design of the very successful Clicgear 3.5 plus push cart and judging from the success of this golf push cart it had gigantic shoes to feel. However, . It comes with an overall design improvement that makes the bag and all the bars to be higher off the ground and hence making the movement smoother. Despite the increase in size, the opening and folding are still as comfortable as they were in the three-wheel carts. This cart also has the largest console in all the Clicgear Golf Carts. Looking at its other features below will help you understand just how amazing the trolley is. The dual front brakes that are operated by a lever make it possible for the cart to stop at an instance. This will help prevent bumping into things or other golfers on the green. It has a more aggressive look than other carts which also gives it the feel of a golfing trolley and so with this trolley you never have to worry about it being compared to a shopping cart. Clicgear Model 8.0 has a four-wheel stability that makes it, even more, enjoyable and easier push on rugged terrain. This cart folds flat for easier portability to and from the course and also when storing it the trolley will not take up a lot of space. Although the brakes are very efficient, the lever will require an extra effort to operate, and this can be very draining especially after an 18 hole game. The price is on the higher end of the scale, and so it might not be the best for you when shopping on a budget. CaddyTek has excelled in the manufacture of golf carts and other essential golfing equipment, but One-Click Folding four-wheel V.3 trolley is one of the best golf push cart that they have produced to date. What you will love most about it is probably the four wheels since they make it more stable and also make it move smoother than those with three wheels. Apart from the improved stability, it is also stronger thanks to the aluminum body, and hence, you can be assured that you will have it on the course for a long time. Another thing that makes it a perfect cart is the one-click fold mechanisms that will make it possible to fold it fast in just one simple step. The four wheels make it more balanced and stable than the three wheel carts. This stability can be felt when on the move and also when parking. It is very easy to fold and unfold thanks to the one-click technology that it uses. Tires need no maintenance, and hence this saves you a lot of money and time, and you will also have no downtimes due to maintenance. Although most CaddyTek trolleys are light, this one is lighter than most of them making portability easier and more convenient. Unlike most other carts it rides smoothly on all types of terrain and it is also easy to handle. Before getting used to the foot brake, it will make the cart inconvenient to move but this is only temporary. The elastic bag straps make it look a little bit like a low-quality bag, but the good thing is that they are easy to put on. CaddyTek EZ-Fold has been designed with the average golfer that likes to walk in mind. It is developed to ensure that a golfer can easily move from one hole to the next with all his gear without using too much energy. The cart has some nice wide wheels for stability and smooth flow and the patented one-click fold, and one-press brake system will make things, even more, convenient for you. Apart from this, it also has enough storage for all your golfing equipment. It is a simple device but with all the necessary features to ensure easy mobility around the course. 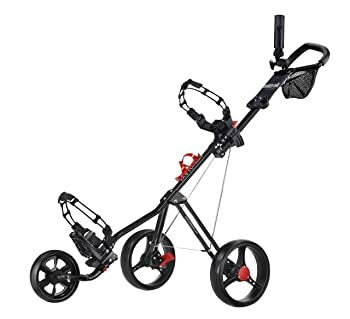 It is lightweight and portable, and this ensures maximum convenience when moving around the green with all your gear and when transporting it to and from the course. You can fold and unfold it almost effortlessly since it uses the patented One-click button that lets you fold it in two easy steps. Apart from its many excellent features and ease of use, it is a beautiful device that comes in a variety of colors for you to choose from. Compared to other trolleys of the same caliber and features it is relatively cheaper. The solid aluminum construction makes it tough and hence able to withstand the severe conditions of a golf course for many years. CaddyTek EZ-Fold does not have a locking mechanism to keep it in place when folded, and this might give you a lot of trouble. It has a foot brake system rather than the handbrake system that a majority of golfers prefer on their carts. You cannot be able to control its motion by slowing it down because it can only either move or stop.